The legendary 1922 discovery of King Tutankhamen's tomb was the 62nd burial discovered in the Valley of the Kings. Amazingly, it wouldn't be until 2005 that a 63rd tomb was found. Now, a newly announced, pristine tomb is number 64. According to inscriptions inside the tomb, which has been designated KV64 - Tutankhamen's chamber is, logically enough, KV62 - the mummy found within belonged to Nehmes Bastet, a daughter of the high priest of Amon who sang at a temple. She lived sometime during the 22nd Dynasty of pharaohs, which dates back between 945 and 712 BCE. Her mummy was placed in a wooden sarcophagus that had been painted black and emblazoned with various hieroglyphic inscriptions. The Valley of the Kings was primarily meant as a secret burial place for pharaohs - hence the "kings" part of the name - but the discovery of KV64 shows that ordinary individuals could also gain internment there. Admittedly, the Valley of the Kings completely failed as a secret burial place, with most of the tombs ransacked and looted not long after the dead were laid to rest. 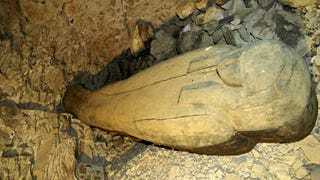 That makes KV64 even more exciting - like Tutankhamen's tomb, it hasn't been touched since Nehmes was buried. Admittedly, that burial itself probably counted as a disturbance of the original site. The tomb itself dates back about 400 years earlier than Nehmes's mummy and then reused for whatever reason. Right now, it's unknown whether another mummy was originally placed in the tomb, or if it perhaps was originally not a tomb at all but some other facility. That could make it like KV63, which was found in 2005 and is now known to have been a storage chamber for mummification tools. The tomb was initially discovered in January 2011 but the find is only now being officially announced. The tomb has only just been opened to excavations, so we will likely learn a lot more about what's this tomb can tell us in the next few months. Via BBC News. Image by AFP.